A quiet, reflective Tokyo Motor Show this year, in a country that's very far from recovered from the disasters that struck in March. Every speech from every MD, including Martin Winterkorn of VW, mentioned the earthquake and tsunami, which was only right and proper - and the floods in Thailand weren't forgotten either. With that as the canvas, it was never going to be a bright and zippy show. In fact, Toyota's stand was actually dark, lit by very few lights. Strange. The stars were the Toyota 86/Subaru BRZ twins.The little coupe marks a new direction for Toyota - its first sports car in nearly a decade, commissioned by a boss who recognises the need for some dynamic thrills to lift a dull range, and developed in partnership with Subaru. It's a new direction for Subaru as well, one that Subaru Australia isn't quite ready to take. That is, rear-wheel-drive instead of 'All 4 The Driver' 4x4. Officially no decision will be made on whether or not the car will be sold in Australia until mid-December. Unofficially, we reckon Subaru's all but certain to sell it Down Under. There were few stars here - sorry I can't get more excited about this event, but that's just how it was. Volkswagen, Japan's top-selling imported brand for 12 years straight, revealed its new Cross Concept, a sporty Evoque-like small hybrid SUV that has strong hints of the next Tiguan in its proportions and sits on VW's new modular MQB platform. 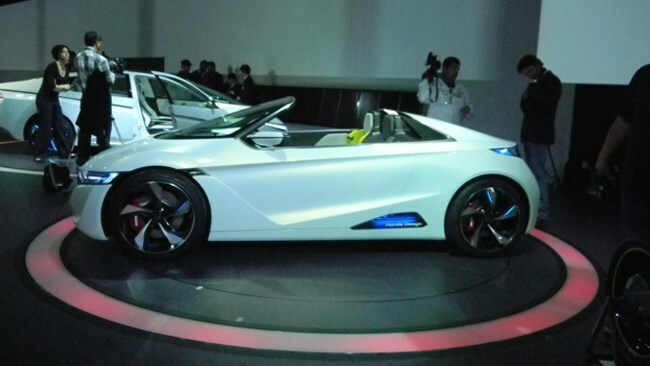 Toyota unveiled its FCV-R hydrogen fuel cell sedan, Mazda showed its precursor to the next 6, the Takeri concept - beautiful and very close to production - and Honda's EV-ster roadster showed what future sporty Hondas might look like. But Honda's message, and those of the other manufacturers, wasn't about 'sporty' - it was about environment, austerity, reflection and belt-tightening. Not as bad as the post-GFC Tokyo show of two years ago, but still very much a show produced by an industry in troubled times.